Field guides, fishing magazines, and other resources both technical and esoteric eventually pin down a single common name for each species as all eventually drift to agreeing on one of them. Even lota lota A fish with a whole lotta lotta names such as Cusk (the local name, also shared with a saltwater fish), ling, lawyer (why would someone insult a fish), etc. Is called Burbot by almost EVERY fish book and guide. But for Esox Americanus both redfin and grass pickerel seem to be used almost equally. Shouldn't it be time for the fish community to decide on a single common name for it to ease up on confusion? No other fish I can think of has its subspecies given equal name time in print. Edited by FirstChAoS, 09 October 2011 - 12:57 AM. I like finning down. Let's use that from now on to honing in on a name. When I moved to Louisiana it just confirmed that there will never be standardization to common fish names. So many fish out here are commonly called by two, three, or four different names. I run by people that have caught and eaten bowfin their whole lives, but don't know what a bowfin is. It's a choupique. Go a little ways west into East TX, and they don't know what a bowfin is because it's a grinnel. I could go on with all the different fish names I've run into in my life. In my opinion, eliminating the variety of common names is equivalent to the homogenization of language and global homogenization of culture. We have scientific names for order, but common names are a cultural phenomenon. For Esox americanus there are two subspecies, the grass pickerel (Esox americanus vermiculatus) and the redfin pickerel (Esox americanus americanus). Really, they are two distinct fish, although the nomenclature could change at some point. I prefer common names for simplicity in conversation. I also agree with rjmtx in liking the regional variations. It is as much fun learning the regional variations on the names as it is learning the scientific names. Much like the food we eat, we are losing the character of the various regions around the country. He lives in an area that probably hangs on to its regional traditions better than anywhere I have ever traveled. And, if necessary, we can break out the latin. But for the most part, it is unnecessary. The thing about the latin is that except for fish I am familiar with I always have to run to a search engine to find what you're talking about. But isnt that also true for common names... I mean do you immediately recognize the longjaw minnow or a longnose shiner? I know I would not have... a few weeks ago... and had to look them up. Now, I am researching both of these... and enjoying the longjaws as they seem to adapt well to tank life. Good point, Michael. However, the names shiner and minnow gives you some idea of what they are. I don't know what the scientific names are for them without looking them up, but I do know what a shiner is and it gives me some ability to follow the conversation. Scientific names are important, but common names can be more useful in conversation. My conversations with people about local fish are always about bream, bass, or chub. With that, I usually have little clue what they're talking about, since they're not getting their names from the AFS list of common names or some other coherent source. I've seriously thought about a custom t-shirt that says, "Please don't say bream in front of me" or some other snarky line. One that drove me nuts where I grew up was calling walleye (Sander vitreum) a pickerel or walleyed pike. They really believed they were a type of pike, not perch. I still bet messed up on the Sander (the newer name for the genus) and Zander (a European "pike perch"). But then, I grew up with the genus name of Stizostedion. Another one that I am still not sure of is Northern Longear Sunfish (or is it the Northern Sunfish? ), Lepomis megalotis peltastes (or is it Lepomis peltastes?). It varies from one credible source to another. I agree that the scientific name is the proper way to positively identify a specimen. And fish taxonomy, with all of its inherent frustrations, is something I enjoy and try to keep up on. But I don't see a problem with using common names, either. Birders have been doing so for decades and seem to communicate pretty well. Maybe that is my point - is the price of admission to these boards the knowledge of scientific names for everything we deal with? I am not a plant person. While not the avid fish keeper that I used to be, I still have a tank or sometimes two. And I am trying to learn more about planted aquaria through this forum. I really like what I have learned from some of the more knowledgeable members regarding soil substrates. But sometimes the threads get so dense with scientific names of plants I skip over them because I don't have the time or desire to look up those names. I would hate to think that we have visitors who are interested in native non-game fish, or game fish for that matter, come here and become intimidated by the use of scientific names. Especially in cases where it isn't needed to convey the message. Its one of our opportunities to draw in new people. I can hold my own with scientific names for fish, but I will most often use the accepted common name unless the latin is necessary. But that is just my opinion, and I am OK if it is not the majority. As far as variations on the accepted common names, if I can keep track of which species from the genus Salmo were moved to the existing genus Oncorhynchus I can learn to cope with the occasional brim or lawyer fish. ... I am trying to learn more about planted aquaria through this forum. ... But sometimes the threads get so dense with scientific names of plants I skip over them because I don't have the time or desire to look up those names. I would like to apologize for any 'denseness' and would like to explain why I often use latin names when referring to plants. Plants of the same genus usually have a lot in common with one another. If I see that something is a Myriophyllum, for example, I immediately start thinking about its allelopathic influence on the plants around it. Myriophyllum spicatum is a famous invasive plant that is successful in part because of its allelopathic chemicals. When I had Myriophyllum aquaticum in my tank, the Cabomba caroliniana that was also in the tank mysteriously stopped growing and eventually died off. Now that I have a large 'community tank' of a good half dozen plant species, I'm watching them all carefully because one of the plants in there is Myriophyllum pinnatum, and I know that that genus is famous for killing the plants around them through chemical warfare. Anyway, that's why I use genus species names for plants. I try to make sure that I stick some common names into the discussion in the beginning as well, so that later when I type Ceratophyllum demersum, for example, people also know that I'm talking about hornwort AKA coontail. Edited by EricaWieser, 10 October 2011 - 10:00 AM. Where this group gets caught is between the crossfire of taxonomists who are working out hypotheses (not truth) among relationships between populations of similar fish, and the fact that native fish aquaria appeals to people who like to "know" things... The combination of both is particularly harrowing to those starting out on this adventure. My advice is... Don't get caught up in the professional taxonomy unless it's your job. It's insanity to do so. It's the working end of science, and hypotheses will be test and retest, and can conclude different results depending on the interpreter and their reviewers. When science is working the best, it's subject to new evidence that can support or refute current hypotheses. It's a hypothesis. Did I say already? However, I've just read three very interesting general examples of evolution that can be discussed with anyone, using names that can be expressed with meaning to anyone from ages 4 to 94. There's something to "redfin pickerel" and "grass pickerel" in multiple evolutionary senses... One name evokes a habitat of tannic waters of the Atlantic and Gulf Coasts, the other evokes the clear waters of the interior uplands of the Midwest, yet both are meso-sized burst predators living among vegetation. The names evoke a sense of imagination on behalf of the learner, and it would be a mistake to get them lost in the details of the story through the Mississippi Delta. It's a neat story to know both parts, the differences in habitats as they relate to the genes that are expressed, and the learner can feel smart by knowing the two population CENTERS (not the areas of dispute on the edges). So if you want to be a professional ichthyologist, your purpose may be to keep track of the current state of these relationships... but for most of us, I think we will achieve a greater benefit in society by understanding WHY there are differences as names relate to taxonomy, and most of all by taking time to interpret the variation to the public in a way that's meaningful to anyone willing to listen. Edited by farmertodd, 10 October 2011 - 10:36 AM. Thanks Todd, I think you're ready to lead an intro philosophy class, "Ways of Knowing". And that's a tough challenge! Edited by farmertodd, 11 October 2011 - 10:34 AM. A simple solution and an educaional one at that is simply to adopt a standard for posts that where when ever you identify a species (plant or animal) that you name the common name followed by the scientific name in parenthese. If a person only knows the common name then that is used and some kind member will fill in the scientific name later in the thread. No need to make the name a point of contention or exasperation but for clarification we try to include both. Edited by Usil, 11 October 2011 - 11:36 AM. Some of my relatives live in northern Iowa, and me and my family visit them several times a year. The tiny meandering creeks you can find in some places are fantastically clear compared to the straight, muddy ditches so common further south here in cornland. While there, I can't help but go out and try to see what I can catch.... when it comes to cyprinids, I always end up mixing up the blacknose DACE with the blacknose SHINERS that are both found there. I never bring any home, but they are rather similar looking minnows to an amateur and their names are easily confused. It's nice to know that I haven't been the only one to trip up over something like that! That is a good idea, but might be overkill on a discussion board like this one. I am not sure there is a right or wrong answer, just different opinions. A discussion like this one is good every now and then. Like many of the other debates here, the answer is situational. Sometimes a scientific name is needed, sometimes the common name is fine. Feh, you fish people have it easy. Try figuring out the various common names of the asters, along with their new taxonomical organizations. Not only will it make your head spin, it might pop right off! Plants of the same genus usually have a lot in common with one another. Exactly. While I do quite enjoy the different common names and the regional differences, when I need to be specific across regions, I tend to use the Latin. One could say "oatgrass" which could refer to any species in at least 11 genera. But if I say "Uniola", you can at least narrow down what I am talking about. Same goes for "darter". I may not know the species, but I can infer a lot by knowing if it is a Percina or an Etheostoma. "Brown smudgy darter", while sounding descriptive, doesn't really tell me anything about the fish other than that it is a drab-ish brown. I don't know anything about its water column preferences, food preferences, or other particulars. Besides, I don't mind looking up a Latin name that I don't know. I come here to learn new things about fishes. Taxonomic relationships are one of them. If I see that something is a Myriophyllum, for example, I immediately start thinking about its allelopathic influence on the plants around it. Myriophyllum spicatum is a famous invasive plant that is successful in part because of its allelopathic chemicals. When I had Myriophyllum aquaticum in my tank, the Cabomba caroliniana that was also in the tank mysteriously stopped growing and eventually died off. Now that I have a large 'community tank' of a good half dozen plant species, I'm watching them all carefully because one of the plants in there is Myriophyllum pinnatum, and I know that that genus is famous for killing the plants around them through chemical warfare. A separate subject here, but regarding M. spicatum and allelopathy - while there are a lot of studies regarding the allelopathic effects of that M. spicatum on cyanobacteria, there are actually very few that suggest any effect on aquatic plants. So few, in fact, that I really would not assume that this is what did your Cabomba in. I think it more likely that your Cabomba melted for the myriad of reasons that it frequently melts in other people's tanks. I'm willing to believe that it wasn't the myriophyllum's fault the cabomba melted. That was the third time I'd bought Cabomba caroliniana, and it had melted eventually both times in the past. I had just moved the tank, and the cabomba never perked back up after the change to the new location. "A high allelopathic potential of M. verticillatum was concluded from high tissue concentrations of total phenolic compounds of 6%–12% of dry matter, the demonstrated release of bioactive polyphenols into the surrounding medium, and the inhibition of cyanobacteria by extracts." from the paper In Situ Allelopathic Potential of Myriophyllum verticillatum (Haloragaceae) Against Selected Phytoplankton Species. Edited by EricaWieser, 13 October 2011 - 08:13 PM. Same goes for "darter". I may not know the species, but I can infer a lot by knowing if it is a Percina or an Etheostoma. "Brown smudgy darter", while sounding descriptive, doesn't really tell me anything about the fish other than that it is a drab-ish brown. And even that may not tell you anything... 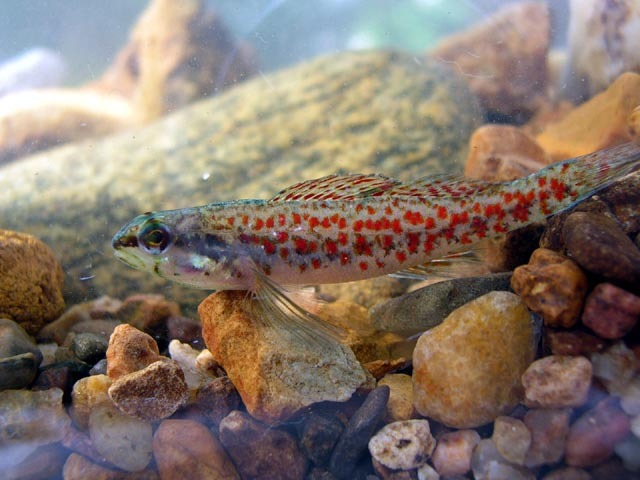 I mean Brown Darter... Etheostoma edwini... is actually a beautiful little guy covered in red spots?! ?